Scroll down for Delicious Baked Fish Recipes and other seafood dishes. Seafood is always a healthy and delicious menu selection and there are countless fish recipes to choose from. For more fabulous breakfast, lunch, dinner, dessert, and snack recipes, see the links at the bottom of this page. 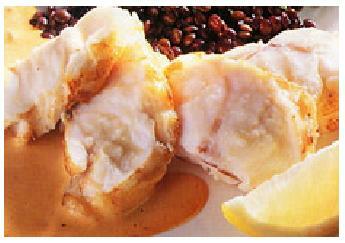 Shown below is a recipe for Roasted Monkfish. Monkfish has a taste and texture similar to lobster, so it's often enjoyed steamed, and served with lemon and drawn butter. Take the fish from the fridge 30 minutes before you need it. To make the sauce, put the whole garlic cloves, tomatoes and hazelnuts into a shallow roasting tray in the oven for 10 minutes, then add the chillies. Cook for another 5 minutes until the hazelnuts are golden. Put mixture into the blender with the egg yolk, and blend on high speed while slowly adding the olive oil. Stir in the vinegar, season lightly, cover, and leave aside. Turn the oven up to 400°F (200°C) and lightly oil the fish filets. Heat a large frying pan, add the remaining oil, and when it is very hot put the oiled fillets in and lightly brown on all sides. Transfer them to the roasting tray and cook on the top shelf of the oven for about 15 minutes. Remove from the oven, season with salt and black pepper, and sprinkle filets with lemon juice. Slice the fillets across the diagonal on to warmed serving plates, pour over a little of the fish juice and serve with the romesco sauce, sprigs of parsley and lemon wedges. Monkfish is a feature in many of America's favorite Baked Fish Recipes. 1. Thoroughly rinse 2 pounds of catfish filets & remove excess moisture with paper towels. 2. Season the fish on both sides with enough salt & pepper to suit your taste. 3. In a medium sized bowl, beat eggs with 2 tablespoons of water. Set this aside. 4. Thinly coat both sides of the fish with flour. 5. Dip the flour covered filets in the egg mixture. 6. Coat filets on both sides with bread crumbs. 7. Fry filets in peanut oil. Cook until the fish flakes easily with a fork (about 4 minutes). 8. Squeeze a few drops of fresh lemon juice onto the fish if desired. Serving suggestion: Serve with hush puppies, coleslaw, baked beans and iced tea for a traditional southern fish fry.